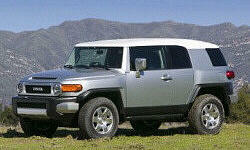 Toyota FJ Cruiser Pros and Cons | Page 1 of 2 | Why Not This Car? What drives people to buy (or not buy) a certain car? 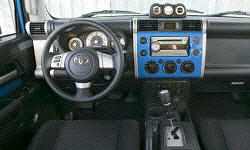 TrueDelta's members share Toyota FJ Cruiser pros and cons based on their real-world driving experiences. Very claustrophobic. The windshield is very short for as large as the vehicle is. Also, the half doors (and small windows) makes for a very large blind spot on the sides. Spare tire intrudes on rear visibility. Side visibility also poor due to wide pillers. Great retro style, and outstanding build quality. Powerful V-6 with plenty of starting/acceleration when driving in the city. Option of locking rear differential absolute must when off-road. Strong as an ox, and yet very precise in the handling. Turns on a dime too. Mixed history with Chrysler, Ford, Honda, and GM products. Previous experiences with Toyota products have all been extremely positive. They just keep going and going. Lots of room in the back, tie down hooks inside and rubber floors make it easy to maintain. Good towing capacity but kind of squirly feeling with bigger trailers. Short wheel base and large tires are detrimental to towing comfort. FJ is manufactured and assembled in Japan. Reliability and durability will be excellent. Lack of maintenance costs means better value throughout the life of the vehicle and increasing value overall. Can you say, Tonka toy without a reason? It is a Toyota; what more do you need to say? Similar drive train to the 4 Runner so very reliable. For an SUV with this power, very quiet & tightly contained. Bold lines, looks very similar to the original models.